What does “Aloha” mean? According to To-Hawaii.com, “aloha” can mean hello, goodbye, love and affection. But its meaning goes well beyond any definition you can find in dictionaries. In Hawaii, you hear aloha all the time and you are treated with aloha everywhere. (Hawaii is called the Aloha State, and for good reason.) Aloha express the charm, warmth and sincerity of Hawaii’s people. It was the working philosophy of Native Hawaiians; they felt it was presented as a gift to the people of Hawaii by one of their ancient gods. The literal meaning of aloha is “the presence of breath” or “the breath of life.” (It’s interesting that in the Bible, in the book of Genesis, when God created Adam He “breathed into him the breath of life,” and Adam “became a living being.”) The word “aloha” comes from “Alo,” meaning presence, front and face, and “ha,” meaning breath. According to the old kahunas (priests), being able to live the Spirit of Aloha was a way of sending and receiving positive energy, or living in harmony. Aloha was and still is a way of living and treating each other with love and respect. Inspired by the philosophy and the wisdom of the Spirit of Aloha, nowadays many institutions and businesses in Hawaii carry its name: Aloha Tower, Aloha Stadium and Aloha Airlines. Many Hawaiian singers write and perform songs about aloha as well. Believe it or not, Aloha Spirit is considered a state “law.” Although the word law sounds too strong and strict, Aloha Spirit is not a type of law that will get you in trouble if you break it. Having “the Law of Aloha Spirit” on the books serves as a reminder to government officials (while they perform their duties) to treat people with deep care and respect, just like their ancestors did. Aloha Spirit is more a lesson than a law. By learning and applying this lesson to real life, government officials can contribute to a better world, a world filled with aloha. So by now you may understand that “Aloha” is more than a word of greeting or farewell, or a salutation. Aloha means mutual regard and affection, and is a reminder to extend warmth and caring for others with no obligation (payback) in return. Furthermore, aloha is the essence of relationships in which each person is important to every other person. This is one of the best photos I’ve ever taken … and for it to be of Quomulongma (Mt. 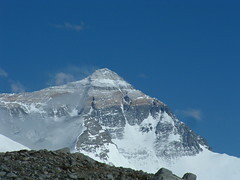 Everest) humbles me. I was very blessed that day. I had my two sons with me – Brandon and Chris – and they enjoyed this trip of a lifetime immensely.